-All fees listed are in US Dollars. -If you are paying by check, make the check payable (in U.S. funds) to "SMDM." Please write registrant's name on check. -Please see the Policies section below to view more information on meeting registration policies. 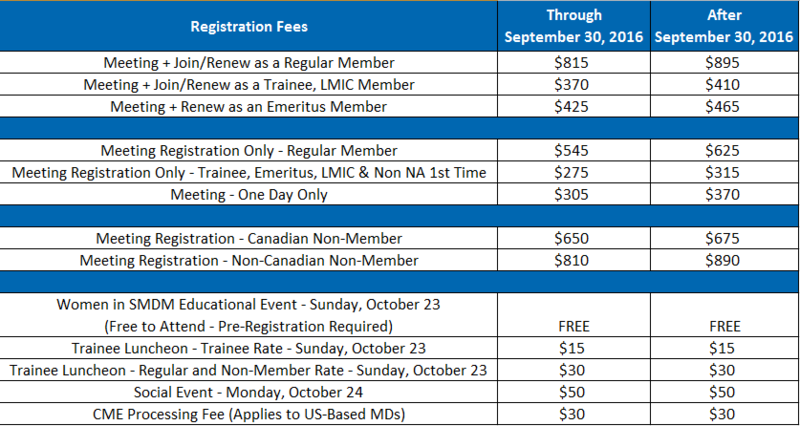 Meeting registration fees cover the two and a half day general meeting from October 24 - 26, 2016 as well as the Sunday, October 23 evening Welcome Reception. Early Bird Deadline is Friday, September 30, 2016. 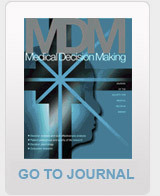 SMDM members qualify for discounted meeting rates. Become a member of SMDM or renew your membership by selecting the Annual Meeting + Membership package and your membership will be honored through December 31, 2017. Click here to view the current exchange rate for US Dollars to Canadian Dollars. Click here to view the current exchange rate for all other currencies. We will accept notification of cancellations up until Friday, September 30, 2016. (3 weeks out) All requests must be in writing, faxed to (908) 450-1119 OR email to info@smdm.org. Cancellations received on or prior to Friday, September 30, 2016 will receive a full refund, less a $50 administrative fee, after the conclusion of the meeting. No refunds will be given after Friday, September 30, 2016. Reimbursement will be issued in the form that payment was received. Please allow 4 weeks for reimbursements to be processed. In the unlikely event that SMDM shall deem it necessary to cancel the meeting, all pre-paid registration fees will be reimbursed. SMDM shall not be liable for reimbursing the cost of travel or accommodation arrangements made by individual delegates. By registering / attending this event, constitutes consent for the Society for Medical Decision Making to communicate with you via fax, e-mail, mail, text messaging, instant messaging, social media and to make you aware of products and services.